(Bloomberg) -- Freezing temperatures didn’t stop about 40 people from lining up outside the first legal cannabis store to open in Canada’s largest city, nearly six months after the country legalized recreational pot. “Just the fact that a retail store is opening is amazing, and the fact that I can get it right away instead of having to wait a week and a half is unreal,” said Stephanie Shamon, 20. Ontario is the final province to open bricks-and-mortar marijuana stores after the country legalized the drug on Oct. 17. The government chose to delay the roll out last August after Premier Doug Ford’s Progressive Conservative government was elected. Ford scrapped the former Liberal government’s plan to open government-run pot shops, replacing it with a private retail model. Ontarians have been able to buy legal pot online through the government-run Ontario Cannabis Store. The government has set a temporary initial cap of 25 stores, with the owners selected through a random lottery. Only 10 of those 25 stores had received the necessary licenses from the government to open Monday -- about one store per 1.4 million people -- and the Hunny Pot was the only one to open in Toronto, along with a few others in cities like Ottawa and Kingston. 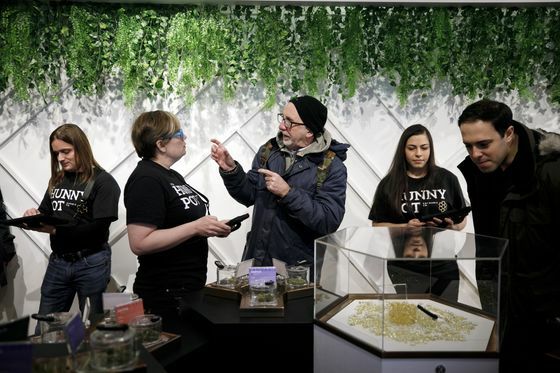 “We knew it was very historic for Canada and we wanted to be here just to experience it,” said Diego Gutierrez, 25, and Amanda Belotta, 23, who were visiting from Los Angeles and decided to line up to see how Canadian pot shops stack up against California’s. The industry has eagerly awaited the first stores in Canada’s most populous province, arguing that it will help boost sales. Canadians spent about C$307 million ($230 million) on legal cannabis in the fourth quarter, while spending on illegal products was C$1.2 billion, according to Statistics Canada.